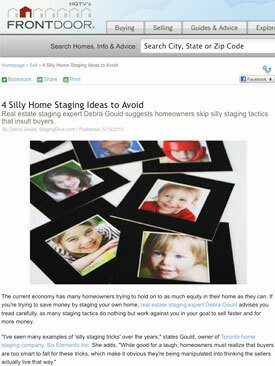 Home staging expert Debra Gould, president of Six Elements Inc. was recently hired to write an article for HGTV’s FrontDoor website on the topic of silly home staging tactics sometimes used by home sellers who decide to stage their own home rather than bringing in an expert. In the story, Debra Gould provides room by room advice on what mistakes to avoid. Read the entire story here on HGTV FrontDoor.